A friend recently began using one of those fancy GPS units in his car. A marvel of modern technology and engineering, this thing has a sultry female voice that recites the directions to any place he tells it he wants to go. It also has all kinds of nifty features to distract from the task at hand (driving in a safe, responsible manner) as he pushes its little buttons and squints at its tiny screen. It even has a suction cup that allows him to stick it to the inside of his windshield, leaving his hands free for eating, drinking and other important tasks like typing messages with his thumbs. Or finding a place with cell phone coverage so he can call me to help figure out where the heck he is. I’ve heard it is possible now to get one of these GPS things with the voice of a celebrity to tell you when and where to turn. If I were to get one I would want Sean Connery’s voice, just to hear him say “Podunk, Vermont”. For his birthday I gave my friend a hard copy of all the information contained in his new gadget. Easily transportable, it even folds up to fit in his pocket or glove box. It is called a map. Most maps show Fish in a Barrel Pond as a small, nondescript blue blob and most of those maps have the name wrong, which is fine with me. 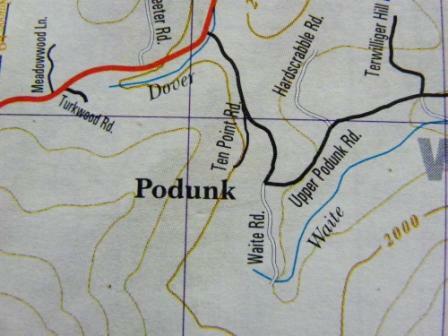 Not that it matters; it seems most people can’t read maps anyway. What they can do, apparently, is blindly follow whatever directions the voice gives them. It is tempting to call these people who couldn’t navigate their own way through a barn door “bird brains” but that would be giving them way too much credit. While my friend drives the back roads holding his phone out the window in search of a signal; while commercial airline pilots with millions of dollars of sophisticated equipment at their disposal overshoot major cities; while couples returning home from vacation drive further and further into the mountains on questionable roads because a voice told them to, a particular flock of ducks — with no instrumentation whatsoever– finds its way to this small, nondescript blue blob every year, more or less on time. Just when the tops of the far hills collect their first snow and the wind begins to flow from the north, the scoters arrive. There is no verifiable, scientific proof that this is the same flock every year but it sure looks like them and even if it were not I would continue to kid the navigationally challenged. They (the scoters) have spent the summer in sub-arctic climes, where they nest in clumps of tall tundra grasses. Their eggs hatch after almost a month and the young leave the nest as soon as they are dry. Powered by whatever insects, snails and freshwater clams they can find for themselves, they grow quickly through the long summer days and are (hopefully) fully fledged by the time halcyon days are done. Juvenile scoters resemble their mothers, mostly drab browns and grays, while the males really stand out with their long, glossy feathers, yellow eyelids and prominent orange-yellow protuberance at the base of their bills. The males are vocal, with a nearly constant, almost mournful, plaintive whistle, which sounds better than “they go ‘wooooo’ a lot”. 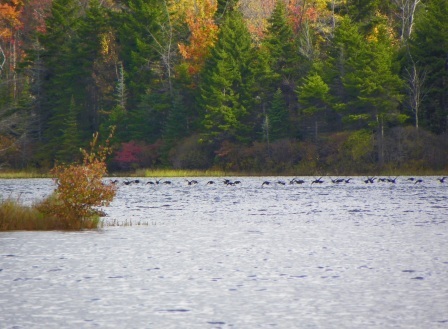 The scoters that visit Fish in a Barrel Pond have flown many miles, from the top of Canada, over Montreal and up Lake Champlain to its southern limit. Hanging a left at the Taconics, they head east over the Green Mountains and make a stop here before continuing on to the Connecticut River and south to the coast. To say they are resting would seem incorrect, for they are nervous birds. 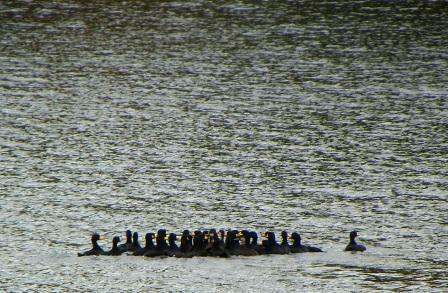 Bunched tightly as a raft, heads bobbing and nodding, they drift across the lake with the males whistling all the way. 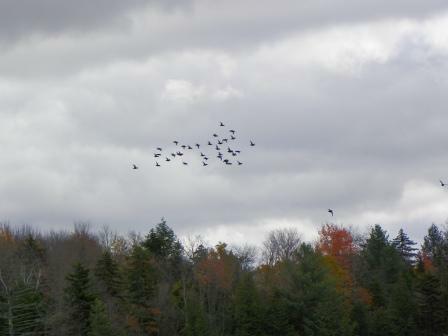 Then, every ten minutes or so, on some unseen signal, they take flight. 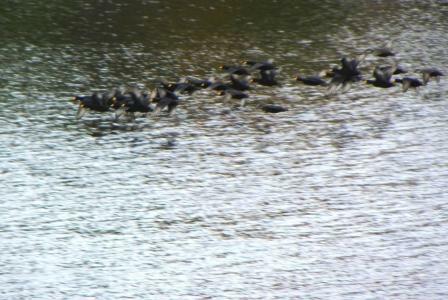 Around and around the lake they go, the whirring of their wings joining the chorus of wooooos and creating quite a din. After the equivalent of what must be 10 or 15 miles of flight they settle back to the water with a long series of splashes, regroup in a little knot and go back to drifting and whistling until something tells them to fly around in circles again. What makes the annual visit of the scoters so interesting to me is that it is so short. I know to look for them on the first day that I step outside, regret not having a hat and wonder how long it would take to find my long-johns. I also know that the very next morning I will be more appropriately attired and they will be gone, headed for some nice spot on the coast where it is warm and they can spend the winter diving for mussels. Choosing a course to follow can be a tricky thing. I had originally planned to steer this thing in one direction, making fun of us and the technologically advanced ways we get lost because we don’t trust our eyes and brains. I was going to point out the superior navigational skills of ducks but as I look at these pictures and go back over my words I begin to notice similarities more than differences. I see nervousness and uncertainty and a lot of going around in circles, heeding the call of something not quite understood. 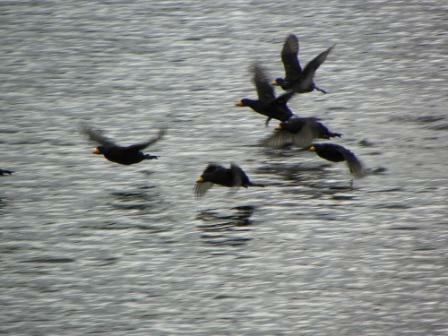 I also notice that the majority of scoters in these pictures are male, as are most of the humans in my examples. Maybe the scoters don’t know where they are, in spite of assurances to the contrary. Maybe they are lost and this is just a convenient place to stop and re-orient. Maybe, like my friend, they should have just stopped and asked for directions. Or maybe they are just following the leader, assuming he knows what he is doing in complete disregard of evidence to the contrary. Now wouldn’t that be uncannily like we human beings?